This dining experience caught my eye some time ago. I love good food and I’m willing to pay for good food, but how much is too much? I actually sat on this for a long time. I went to their page often and looked through the dinners, who was going to be there, what might be served. I drooled every single time. Plunking down the $$$$$ stopped me every single time. I began to really research Portland Food Adventures. I’m not kidding, I have been intrigued by this since I found this site a few months ago. I even threw out the idea to friends hoping to find some company. The more I researched the more I began to think this might not be a bad deal after all. And they will give you gift certificates to 3 of their favorite places in Portland. So basically, it’s the gift that keeps on giving. After you are done dining you have gift certificates to dine at other places. They really make this worth your money. 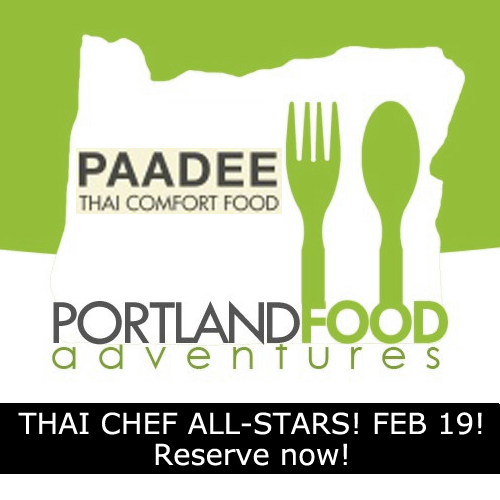 I really love great food, but one of the things that I love about Portland Food Adventures is you get to meet the chefs. I know it sounds nerdy, but I just love talking to chefs. You know the guys and gals that create these fabulous dishes that can’t even wrap your brain around. After a great dining experience, if the restaurant lends itself, I will go and thank the chefs and tell them what I ordered and how great it was. So to get to talk to them and get time with them, it’s a real treat. You won’t get that just dining out. So, you ask, am I doing this? Yep, I am jumping on board for the one on Tuesday, February 19th. There were only a few spots left, and the opportunity came to try this whole Food Adventure. If you are interested check out their site with all the details. If not this one, then maybe the next one? Wondering how this all looks? Well check out the most recent one at Tasty and Alder. I should have done that one, but I was still trying to convince myself. I have looked over the list of all the ones they have done the last few months, and these guys don’t mess around. They are picking the best of the best of Portland. Don’t worry, I will be back to report in. I will give you the full scoop and let you really know if it’s worth it or not. I have a feeling I won’t be disappointed.